Welcome to the BIG FIVE. In the 1950’s, Havana society raised its rum drinks at grand social clubs, and there were no bigger clubs than the Big Five: The Vedado Tennis Club, the Miramar Yacht Club, the Biltmore Yacht & Country Club, the Havana Yacht Club, and the Casino Español. Big Five Rum celebrates the breezy, cosmopolitan leisure of those clubs and the Cuban spirit that flowed through them. Like old Havana’s social clubs, being a member puts you in good company. This club is a state of mind. It’s the spirit of old Havana, where island relaxation meets the decadent excitement of the cabaret. Where mojitos, cuba libres and daiquiris are a way of life. And where you’ll find reason to celebrate, no matter what the occasion. Big 5 Rum is founded by two 1st generation Cuban Americans. (One of our founder’s parents met at the Miramar Yacht Club)! Both founders are veterans in the wine & spirits industry and childhood friends who grew up in Miami, FL. Big 5 Rum was born out of a desire to give back to their Cuban heritage. Big 5 Rum is made from blackstrap sugar cane molasses sourced locally from South Florida sugar cane growers. The molasses is then column distilled four times for a cleaner, more consistent product at the distillery in New Port Richey, Florida. The blackstrap sugarcane molasses used in production creates subtly sweet, caramel depth and matured rum notes; and is known for its robust, yet smooth flavor on the palate. Big 5 Silver Rum is very clean, classic and suave – made in the traditional Caribbean style, this spirit is delicious served in a cuba libre topped with lime. Big 5 Gold Rum has an alluring nose caramel & hints of toffee. This rum completes nightclub sipping in Havana or with good company - a nice twist in a mojito cocktail or add it to your 5PM café con leche or colada. 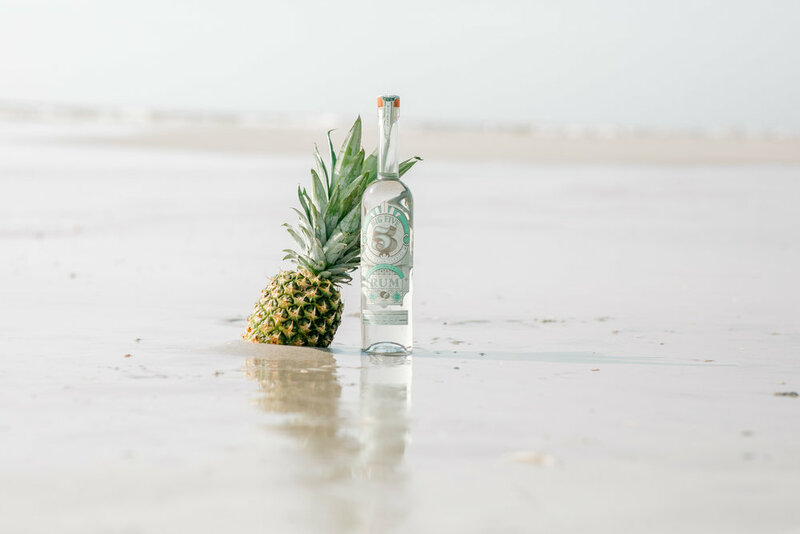 Big 5 Coconut Rum is smooth and fresh on the palate with a touch of sweetness. Made with all-natural coconut flavor, pour over ice. 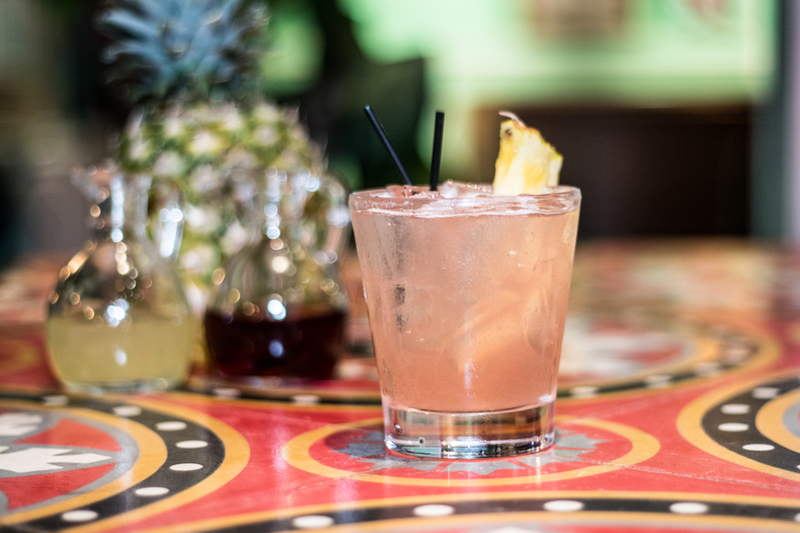 This rum brings you to the beaches of Miami or the rooftop bars of Havana, Cuba. ¡dale! 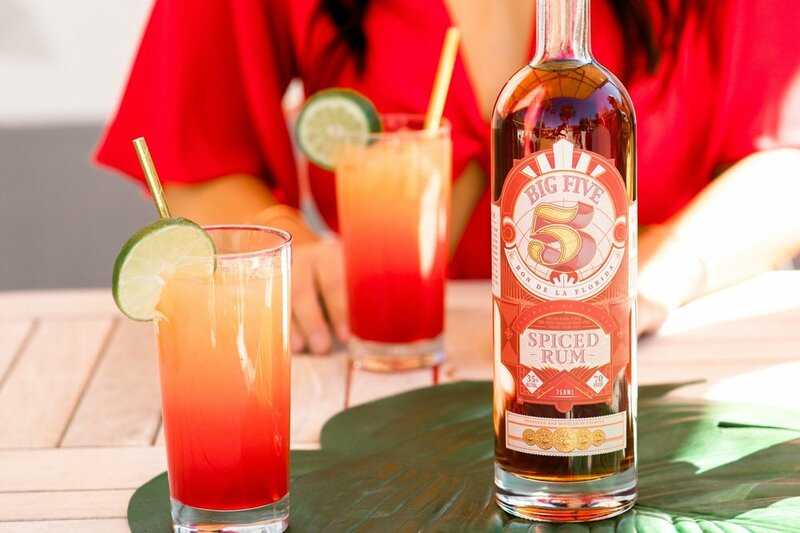 Big 5 Spiced Rum is made with 5 all-natural spices: allspice, clove, nutmeg, vanilla and orange flavors. Delicious in a coquito (Puerto Rican eggnog) or to spice up your Cuba Libre. 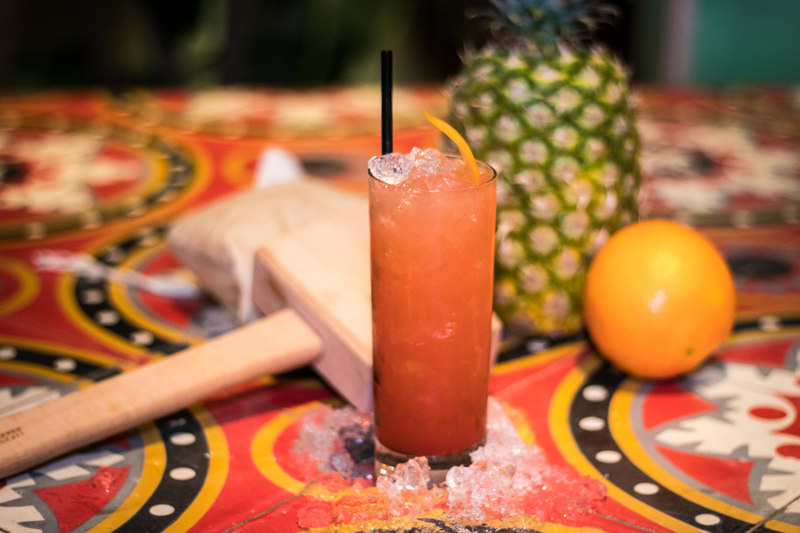 Method: Shake the first four ingredients the strain over crushed ice in a Collins Glass. Top with the grenadine and stir it into the top of the drink. Garnish: Half of an orange wheel and a cherry. Long Straw. Method: build the first four ingredients in a mixing glass and shake to combine, Strain into a highball or Collins glass filled with fresh ice and top with ginger beer. Method: Combine all ingredients in a blender, cover an process at a medium speed until smooth. If it is too thin add a few more ice cubes. Too thick add an ounce of water. Garnish: With a thin lime twist.